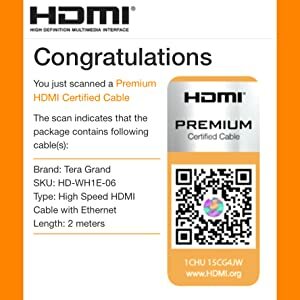 Tera Grand Premium Certified High Speed HDMI Cables Support new HDMI 2.0b features such as 3D, 4K Ultra HD, HDR, Dolby Vision HDR, Audio Return Channel, Dolby TrueHD and DTS-HD Master AudioTM. This label ensures the product was tested by an official HDMI Authorized Testing Center(ATC) through the HDMI 2.0 Premium certification program. 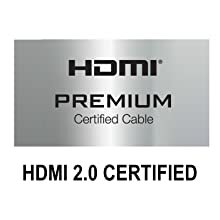 Products with the HDMI Label are officially tested to deliver HDMI 2.0 specs: 4kUHD @ 60hz, 18Gbps, HDR, Dolby Vision, HDR, RGB 4:4:4 Chroma, & HDCP 2.2. Many HDMI cables will fail when put to the task of delivering these specs. When buying the cable with the label, you can buy confidently knowing you can get the most out of your home theater setup. Each of our product packaging has its own verification label on it. The use of the QR code and hologram, each cable has its own unique code to ensure the authenticity of the product. Download the HDMI Premium Cable app to scan and verify. Built with a 24K Gold Plated Connector with Aluminum Housing on both ends. Inside the Aluminum housing and inner mold, there is a Metal Shielding Case which provides maximum protection from EMI & RFI interference as well as greatly increasing structural integrity and longevity. Built with multiple layers of shielding for maximum noise reduction. Less EMI & RFI interference allows for crystal clear visuals and 4K UHD picture. 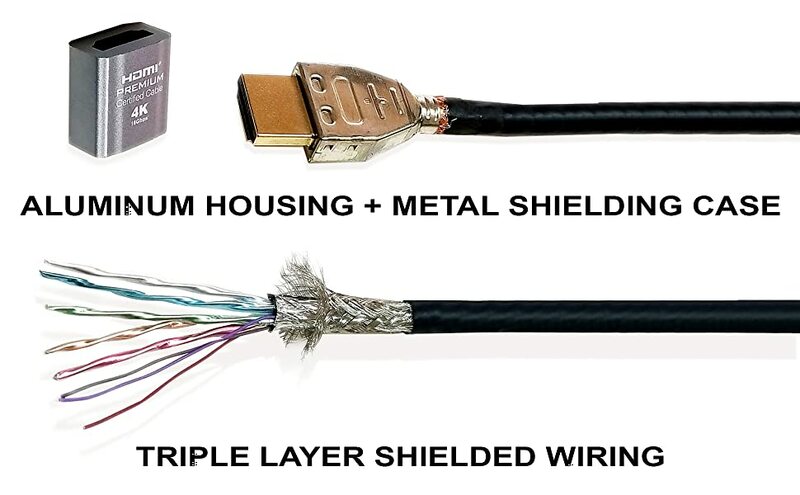 Cable constructed with 3 layers of shielding within wiring with additional shielding on each connector. Connects a standard HDMI device to an 4K TV/other standard HDMI device. Backwards compatible with ALL previous HDMI standards. 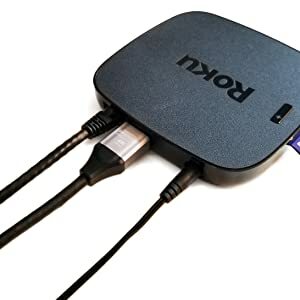 Works with Devices with standard HDMI ports, like 4K UHD TV, HDTV, Blu-Ray player, PS4 Pro, PS4, PS3, Xbox One X, Xbox One S, Xbox One, Xbox 360, Apple TV 4K, Roku, Boxee, Computer, PC, Mac, stereo, monitor & projector. 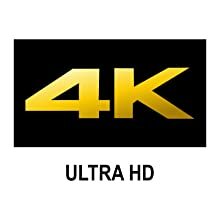 4K UHD (3840x2160p) & 1080p @ 60/50Hz, 1080i, 720p, 480p, and 480i & 21:9 wide angle. Supports increased refresh rates - 240Hz, 480Hz. 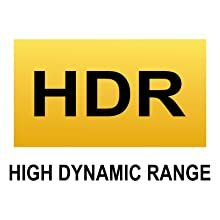 Supports HDR 10, Dolby Vision HDR, 48-Bit deep color, 4:4:4 Chroma, HDCP 2.2 compliant & True HD-Dolby 7.1. 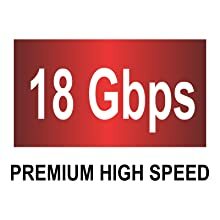 Supports transfer rates of at least 18Gbps enabling HDMI 2.0 features such as 4K UHD at 60Hz. Supports 3D, ARC, & Ethernet channel.